toothpicks or the smallest size package of dowels you can find. 1. If your tree is small like mine (2 ½ inch in diameter foam balls), you may want to break toe dowels or toothpicks in half. For the larger size foam ball you can use the whole toothpick/dowel. 2. Stick the dowels into the foam ball. Push gumdrop on to protruding end. Repeat until the foam ball is mostly covered. 3. When you are 2/3rds done, cover the popsicle stick with the green tape and insert it into the bottom of the ball. I used a sharp knife to create a slit so it was easier to insert the ball. 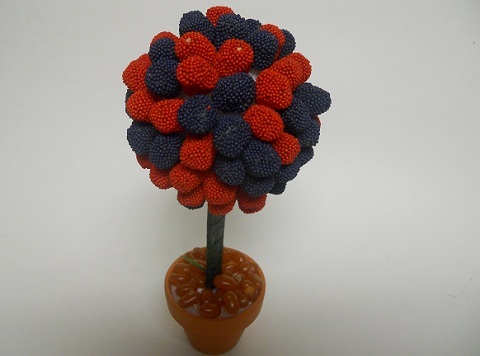 Finish covering the ball with “berries”. Cover the bottom with jelly beans, chocolate chips, etc. Note: this is a very top heavy project, so put it somewhere it won’t get jingled too much. . Repeat with all the colors you wish to use.